Welcome back to Silhouette Sunday. Today I want to talk about using your files. I confess, I am weak when it comes to buying files. 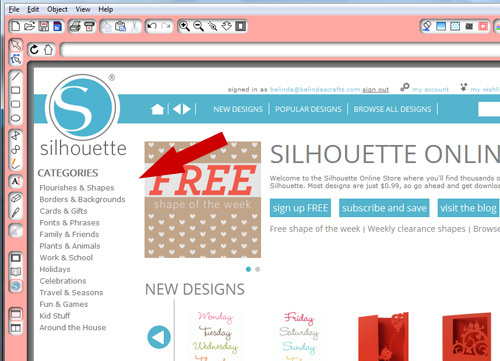 I buy files from the Silhouette store and I also obtain a whole lot of free files on the web. I will share those sources with you in future posts. But the problem is that it can add up fast and before you know it, you have hundreds of files you just don’t know what you have and it seems daunting to organize. But once you do it, you will be able to quickly locate the files you need and stop buying things you already have. The first thing you should do is look at the categories that Silhouette has created in their store. They have 13 main categories and subcategories under each.This gives you an idea for a basic filing system and then from there you can expand to meet your needs. When you create your organizational structure around the Silhouette system, it makes it easy to know where to file the files once you buy them and quicker to find them later. I have attached included a list (in PDF format) of all the categories and subcategories. Print them out for reference and then open up your Silhouette software. 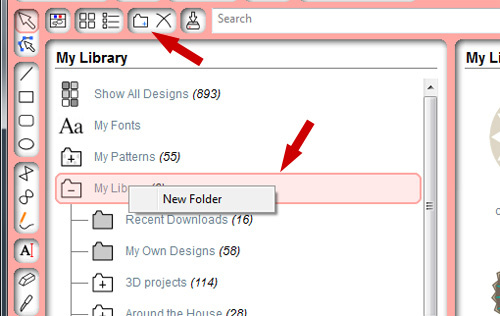 Then click on the New Folder icon on the top task bar or Right click on the My Library icon to create a new folder. Then type the name for the folder. Use the PDF print out to guide you. 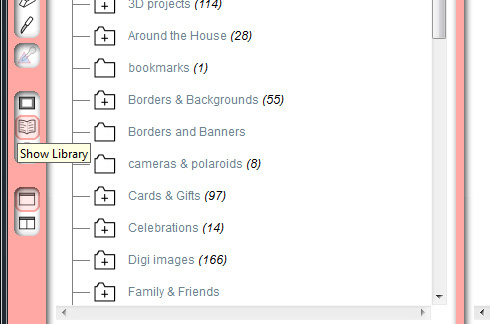 Continue creating the 13 main categories and then you can go back and create sub categories (folders). Click on the folder you want to create a subcategory under and click on the New Folder icon or right click the folder you want to have sub folders under. Continue until you have as many as you like. I used their 13 main categories and then I modified a few to meet my specific needs. Overall, you will find it easier to build off of their list because you will be able to file them as soon as you download them. I still find this machine incredibly fun to use and look forward to expanding my knowledge and sharing it with you. Thanks for joining me today. Thank you Belinda for this idea! I got a new computer for Xmas and have installed the Silhouette software onto it. Now I have a chance to do organize from the beginning! See you Monday. – Karen S.
Oh that is wonderful Karen. If you can print out the PDF of the list and bring it on Monday, I can show you how to create them on your machine. Brenda, Next wednesday at scrap’n I am determined to implement this filing system. Chew me out if I am not working on it. Had a good group meeting this past Monday. New faces to add to our e-mail list. I will hold you to that on Wednesday Cathy! I can’t wait to hear more about the last meeting. I was so sad I couldn’t make it. Bring the e-mails and I will add them to our list. If I can get over to scrap early, I will bring my Silhouette with me. See you then.